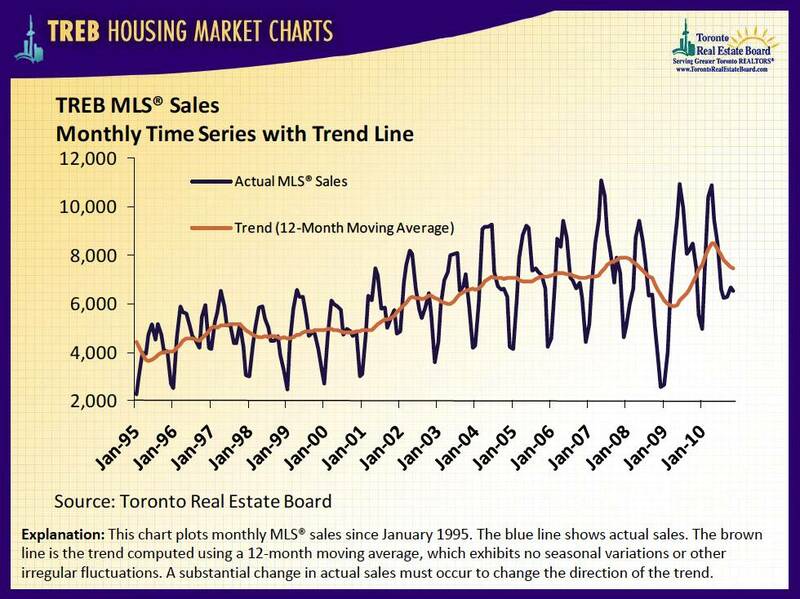 This chart plots the monthly sales-to-new listings ratio (blue line) with year-over-year average annual per cent price change (brown line). When the sales-to-new listings ratio moves higher, average annual per cent change in home prices generally trends higher. 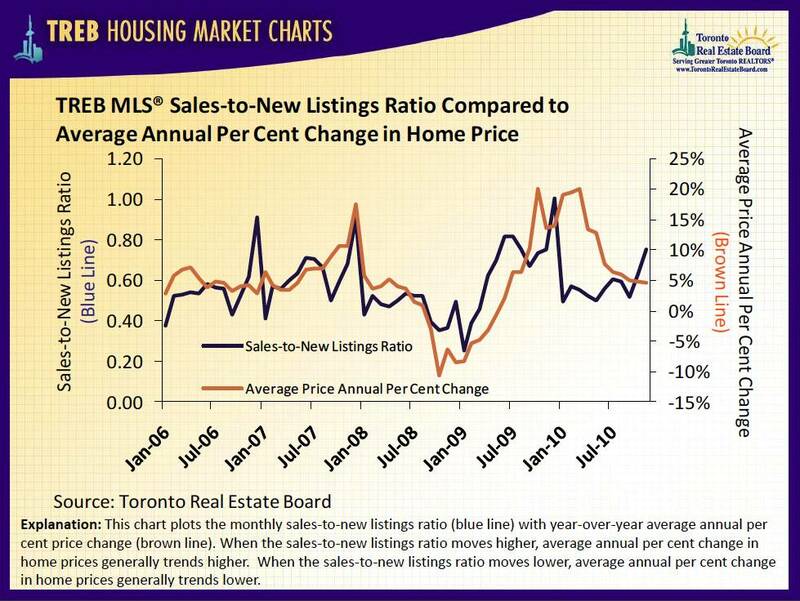 When the sales-to-new listings ratio moves lower, average annual per cent change in home prices generally trends lower. Merry Christmas and all the best to you and your family! 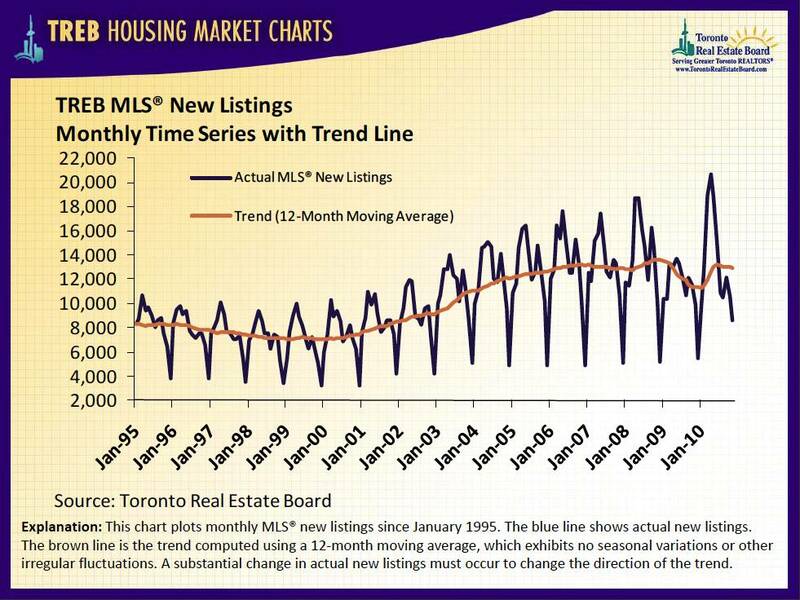 This chart plots monthly MLS® new listings since January 1995. The blue line shows actual new listings. The brown line is the trend computed using a 12-month moving average, which exhibits no seasonal variations or other irregular fluctuations. A substantial change in actual new listings must occur to change the direction of the trend. This video below is very graphic and won many awards. It's about the perils and consequences of drinking and driving. I sent this video to my two teenage boys who are both driving, but I think that you can view it and send it to anyone who drives a vehicle. If you can help stop one person from dying from drinking and driving, then we all succeed. This is for the two people in life that mean the most to me and mean the most to your mother. This is an incredible video. Please read what I say below and watch the video. Your mother and I are always very concerned about both of you when you are out on the road, whether you are driving or a passenger with your friends. When we say 'slow slow' we mean it. Your life could be taken away in an instant and we would never be the same family for the remainder of our lives. Please don't ever drink and drive and please don't ever smoke dope and drive. ALWAYS call us no matter what the time of day or night or no matter where you are if you need a ride, we will always come and pick you up, we don't care where you are or who you are with or what the circumstances are. We don't care about being inconvenienced in the middle of the night. We care about you staying alive, nothing is more important than that. We don't want to get a call from the police that either of you are DEAD because of a car accident, ever. So please, don't drink and drive, don't go into a car where your friend was drinking and driving, never. Lucas, Please watch this video and show it to Kate and pass along to your friends. market has nonetheless gone through a wild ride over the last three years. months ago. This begs the question of where the market is headed from here. forecast from the one last published in our September Quarterly Economic Forecast. The current year appears likely to turn in a performance near what we predicted in September, with annual national sales down slightly from last year. Meanwhile, with listings having seen less upside than anticipated, the annual average home price is set to gain around 7% in 2010. The most important development since our September forecast is that in-creases in borrowing rates foreseen three months ago by TD Economics and most forecasters have been delayed, as uncertainty lingers and the U.S. Federal Reserve is engaging in a second round of quantitative easing. This translates into an improved home sales and average price forecast for next year. We have upgraded our national home sales forecast for 2011, though annual sales should still end up lower than in 2010. On the price front, in line with higher sales and a consequent but more modest uptick in listings, things look markedly better. We now forecast the annual average price for 2011 to remain essentially unchanged, slipping by less than 1%. On the flipside, however, higher borrowing rates remain on the horizon, with the consequence that 2012 sales now look weaker than they did in September. In essence, with limited pent-up demand, higher sales activity in the near-term will likely rob from sales thereafter. In this context, the annual average price is likely to drop a bit further, by 1-2%. Rising interest rates will be the main headwind, but will occur against the backdrop of an improving economy. Along with contained increases in supply, continued but modest gains in income and employment should limit the extent to which homes depreciate. In the midst of the global financial crisis which hit its apex in the fall of 2008, some worried that Canada might be in store for a U.S.-style housing crash. As we argued, that fear proved to be unfounded. 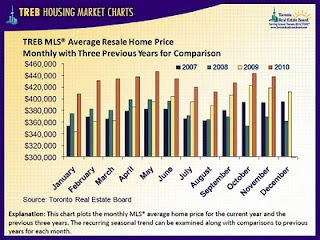 The market experienced a severe downturn in 2008 during which time the average resale price dropped by 13% (peak-to-trough), but it rebounded in quick fashion. In July 2009, only six months after hitting bottom, the average price was already back to its pre-recession peak. Mortgage rates at record lows and lower prices set the stage for that unprecedented turnaround. By the end of 2009, the average price had climbed another 6%. As a result, concerns did a complete U-turn, shifting towards the risk that a hous-ing bubble was brewing. Had the 2009 rebound been sustained for longer, we may well have agreed. But, as expected, it did not last. Sales peaked at year-end 2009, and the average price followed in April 2010. During the first half of this year, sales gave back most of their gains. This was consistent with our view that the 2009 rebound front-loaded activity and borrowed from future demand. Meanwhile, listings retreated and kept the market balance in check, preventing a steep price drop. As of the second half of this year, the market was already experiencing a nascent rebound. As of October 2010, sales were up a cumulative 13% from July and the average price was on a modest uptrend. With mortgage rates dropping lower than initially expected, sales found their footing ahead of our September forecast - which had predicted a trough in the second quarter of 2011. The surprising decline in mortgage rates were the result of lower Government of Canada (GoC) bond yields, which anchor financial institutions' funding costs. For instance, the benchmark 5-year GoC bond yield was near 2% in late October, which translated into an average posted 5-year fixed mortgage rate near 5% - with effective (i.e. negotiated) rates closer to a historical low 3.5%. As a result, home affordability in Q3 saw its first im-provement since early 2010. In turn, demand improved. The recent uptick in sales does not appear to be a blip, par-ticularly in light of its regional breadth. There appears to be more at play, for instance, than volatility related to sales tax harmonization in B.C. and Ontario. If anything, the housing market's gyrations over the last three years confirm the great sensitivity of demand to mortgage rates. While other drivers such as income and em-ployment obviously matter, crunching the numbers reveals that they do not weigh in nearly as much as lending rates do. As such, great attention should be paid to where interest rates are headed. What's more, our forecast for income and employment over the next two years is of the uneventful variety - one of continued but modest growth. In essence, income and employment should grow sufficiently to put a floor under demand, but not so strongly as to sharply tilt the market balance in favour of sellers. Looking ahead, we would caution that the main driver behind our September view that home sales would continue to head lower has not been eliminated, but simply postponed - higher interest rates remain on the horizon. By the same token, the magnitude of increases is expected to be limited. The Bank of Canada's overnight rate is expected to be on hold at 1% until the second half of next year before reaching 2% by year-end 2011, and 3% by year-end 2012.
home affordability over the next two years - although other factors, such as continued income growth, will soften the blow. Moreover, home affordability starts in a good position, with the typi-cal mortgage consuming 28.5% of the average household income as of Q3/2010. This provides continued near-term support for sales, but only up to the point where rising inter-est rates and sticky prices begin to impair the affordability picture. Over the next two years, our home affordability measure is expected to range between 30% and 32%. In historical terms, this is a manageable erosion in affordability compared to 40% and higher observed in the late 1980s. The net result is that home sales can stay elevated for another couple of quarters, but should begin to moderate thereafter. Part of what lies behind the retracement in home sales has been the outsized contribution of first-time homebuyers during the market rebound. Having no built-up equity or capital gains to fall back on, these buyers are more sensitive to changes in affordability - monthly mortgage payments as percentage of income - stemming from inter-est rate changes than existing homeowners. For potential future first-timers, a slight change in borrowing rates can mean the crucial difference between an entry-level purchase and being priced out altogether. They led the resurgence in sales and prices in 2009, but look set for a role reversal as interest rates eventually begin their inevitable trek upwards. As sales flatten out and start to slow over the course of 2011, and with listings expected to stay contained, we expect prices to find a near-term ceiling over the next few quarters. Subsequently, a softer market balance will likely result in a modest price drop of 3-5% (peak-to-trough) in late 2011 and early 2012 before prices stabilize later in the year. All said, the higher interest rate trend fortunately starts as the Canadian housing market is well balanced between listings and sales. This balance does not support suggestions that prices should either surge or suffer a steep correction. This is likely to be a modest market adjustment driven by higher borrowing rates, but cushioned by an improving economy. 2010 was not what bubbles are made of. Similarly, under our forecast interest rate profile, the next two years will not be what crashes are made of. 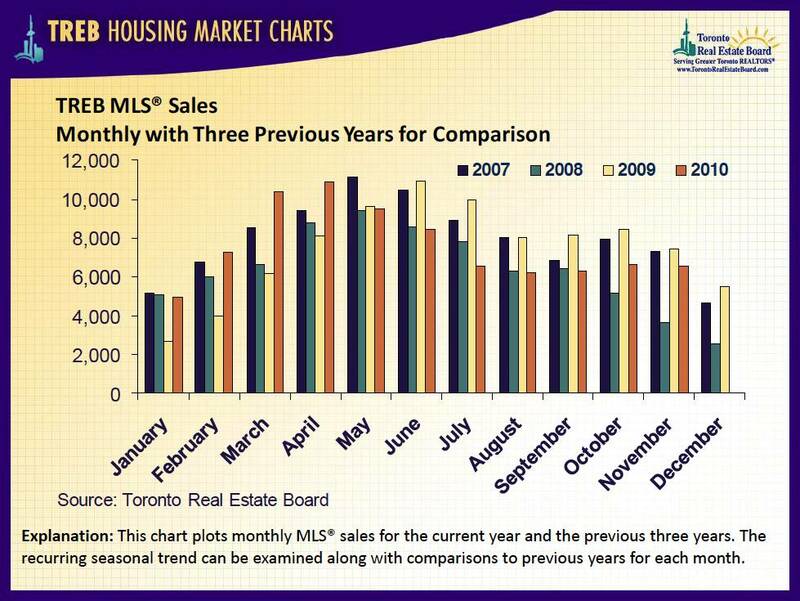 GTA monthly MLS® sales for the current year and the previous three years. 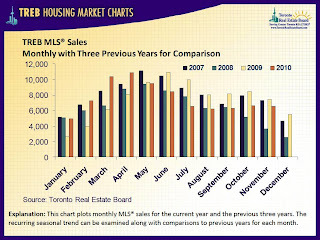 This chart plots monthly MLS® sales for the current year and the previous three years. The recurring seasonal trend can be examined along with comparisons to previous years for each month. 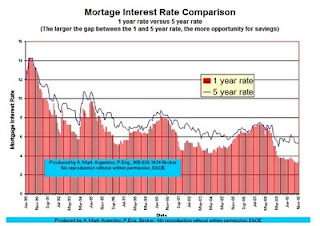 Gap between 1 year and 5 year mortgage interest rate widens! Should I go short or long term on my mortgage? The December real estate report for November was just released. 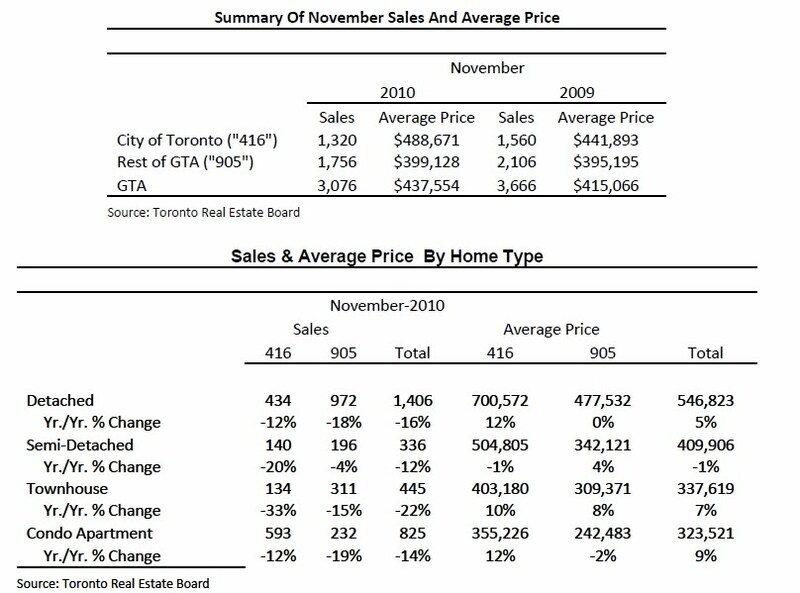 Comparing November 2010 to November 2009 homes sales were down about 13% and the average price is up 5% for the same period. We expect that the next month or so will see a 'typical' market, which is slower than most other months of the year. 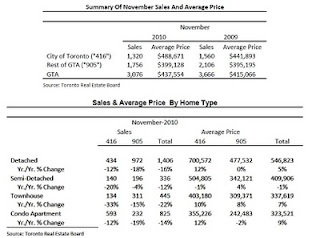 TORONTO, December 3, 2010 -- Greater Toronto REALTORS reported 6,510 existing home sales in November - down 13 per cent from 7,446 sales in November 2009. 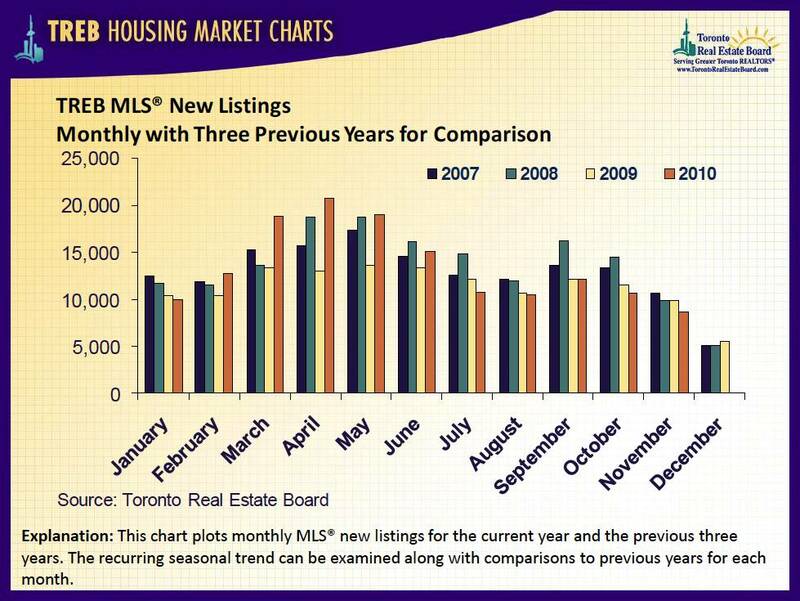 New listings were also down 13 per cent annually to 8,642. "Sales through the first 11 months of the year were down only marginally compared to the same period in 2009. 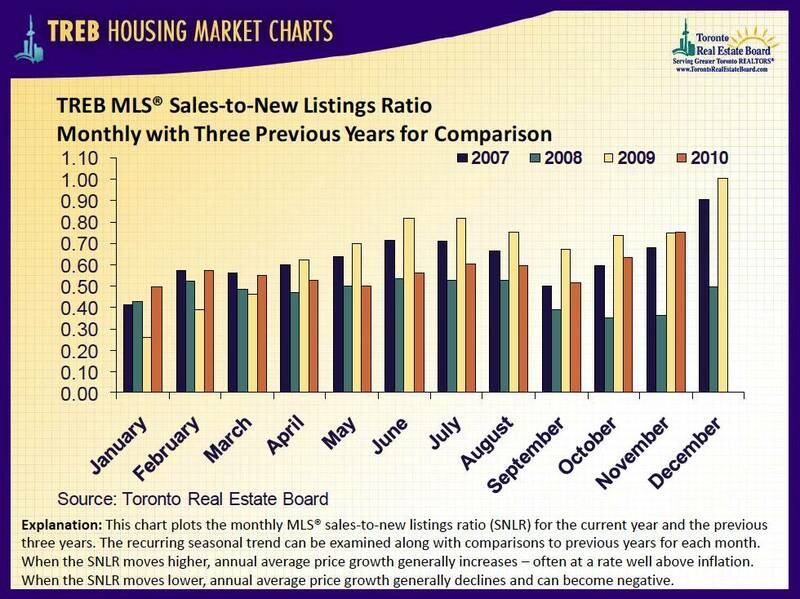 We remain on track for one of the best years on record under the current TREB market area," continued Johnston. 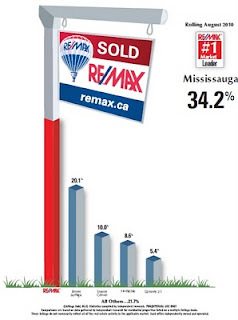 "The average selling price in the GTA is affordable. A household earning the average income can comfortably cover the mortgage payments on an average priced home. Expect the average selling price to grow at a moderate pace in the next while. The bank of Canada has kept it's key lending rate at 1% meaning that bank prime to customers will remain at 3%. The Bank of Canada feels that the rate will remain unchanged at least until the middle of next year. Some feel that the bank raised the prime too fast and too high in the middle and end of 2010 and this has kept our economy from growing as fast as it could. 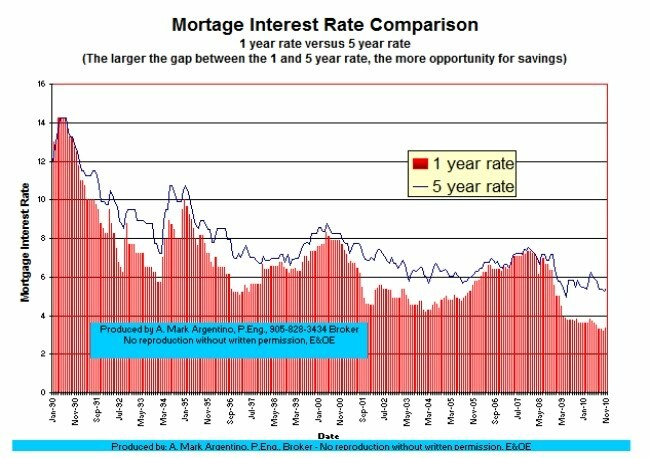 It will be interesting to see how mortgage interest rates react to this recent announcement, stay tuned! These are very interesting statistics just sent to me from my friend Ben. According to Demographia, the Median Multiple has been remarkably similar among the nations surveyed, with median house prices being generally 3.0 or less times median household incomes. In late 2009, Calgary and Montreal were rated "seriously unaffordable", scoring 4.6 and 4.9 respectively. Toronto made it to the "severely unaffordable" hall of fame with a score of 5.2. Vancouver ranked the most unaffordable city amongst the 272 markets surveyed with a price-to-income ratio of 9.3 (Exhibit 4.1). And the price of a home relative to rental income in Canada is amongst the highest in the developed world. In 2006, Fed chairman Ben Bernanke testified in front of Congress that he didn't think housing prices were overpriced. He doubted that home prices would fall much since home prices had not fallen for 60 years. As we now know, that reasoning was an enormous logical fallacy. --"Toro", "Canadian Housing Bubble", RunningOfTheBulls.Typepad.com, August 29, 2010. Very interesting statistics. Yes, the ratio of income to house price is often a measure of how over inflated the prices can be and as you have pointed out, our ratio's are very high. Many say that this is sustainable because of low interest rates, but if the rates increase dramatically, look out! I believe we will have low rates for at least another 5 to maybe 10 years, this is the only way the economy will not fall in upon itself. Bernanke's remarks that house prices will not fall because they have not fallen in 60 years is really absurd! Fix rates are rising. It is time to lock the fixed rate now. They are so low, but won't last long. For pre-approval rate hold, you can get as low as 3.49%, which can be held for 120 days. This special won't last long, so act soon to lock it in. Sales figures for mid month are in. Comparing November 2010 to November 2009 the number of sales is down about 16% Year to date sales are up slightly. TORONTO, November 16, 2010 -- Greater Toronto REALTORS(r) reported 3,076 sales through the Multiple Listing Service(r) (MLS(r)) during the first two weeks of November 2010. This represented a 16 per cent decrease compared to the 3,666 sales recorded during the same period in November 2009. Year-to-date sales amounted to 78,526 - up slightly from the 2009 total. 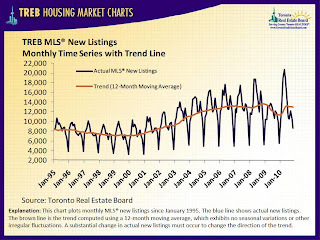 "The number of transactions remained high relative to new listings through the first half of November, promoting a healthy rate of price growth compared to last year," said Toronto Real Estate Board President Bill Johnston. The average price for November mid-month transactions was $437,554 - up more than five per cent compared to the average of $415,066 recorded during the first 14 days of November 2009. 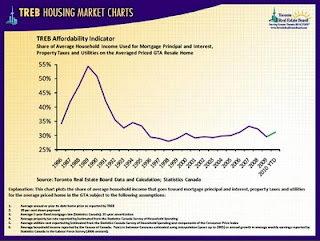 "Mortgage payments on the average priced home remain affordable in the GTA based. 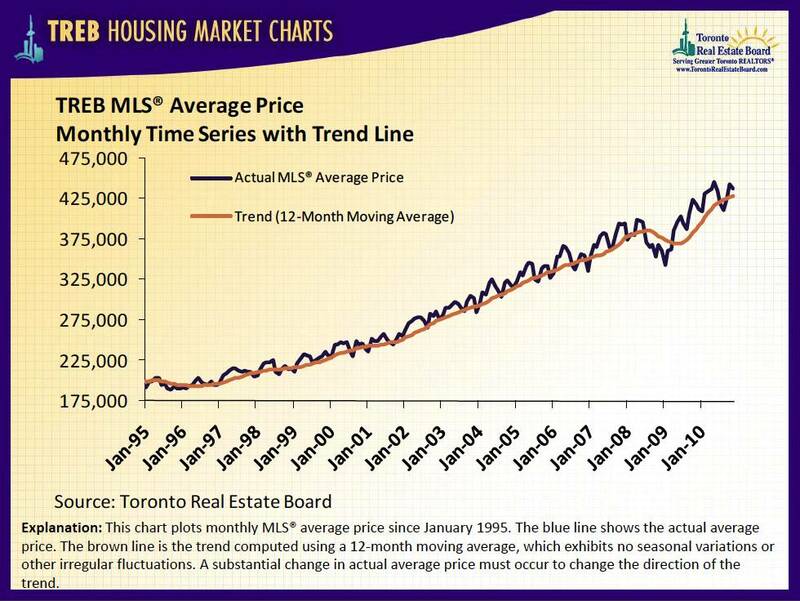 This is why the average selling price continues to increase," said Jason Mercer, TREB's Senior Manager of Market Analysis. So if the market does not crash how are people going to pay for homes ? Should the prices keep rising..... Already most are paying 60% of there income towards their home, how can this continue? People have been saying "How are people going to pay for homes ?" since the mid 80's There are always people who can afford more expensive homes. As long as the economy stays healthy and people are employed, then real estate will continue to get more expensive over time. 60% house payments/income is too high. That's house poor. People have to realize this is too high and puts too much pressure on their lives. They have to settle for less, move out from the expensive core area and commute. Rates may vary and are subject to change without notice OAC. Below is the press release for TD bank for their November outlook. Moderation seems to be a common thread in their announcement. October. This is its highest level since May 2010 and marks the end of a 4-month string of declines. those provinces rising by 10.0%, 9.8%, and 9.1%, respectively. construction and resources sectors drove the headline index, with confidence improving by 20.1% and 14.8%, respectively. Adding to that were an 8.4% increase in arts, recreation & information services, and a 9.8% improvement in professional & business services sectors. months. Hiring intentions have also improved marginally, which is likely due to the declining share of small and mid-sized businesses complaining of insufficient domestic demand. * Today's report was a welcome addition after four straight months of declines in business confidence. * At the same time, however, the fact that the headline index has been relatively trendless so far this year reflects that businesses are continuing to see improvements in demand, but only moderate. This is consistent with TD Economics' forecast for lukewarm 1.5-2% growth in the second half of 2010. * The fact that businesses are becoming more optimistic regarding capital spending provides some additional support for our expectation of continued strength in machinery & equipment investment. After rising by 30% on an annualized basis, M&E is likely to be a major contributor to growth in the coming quarters. 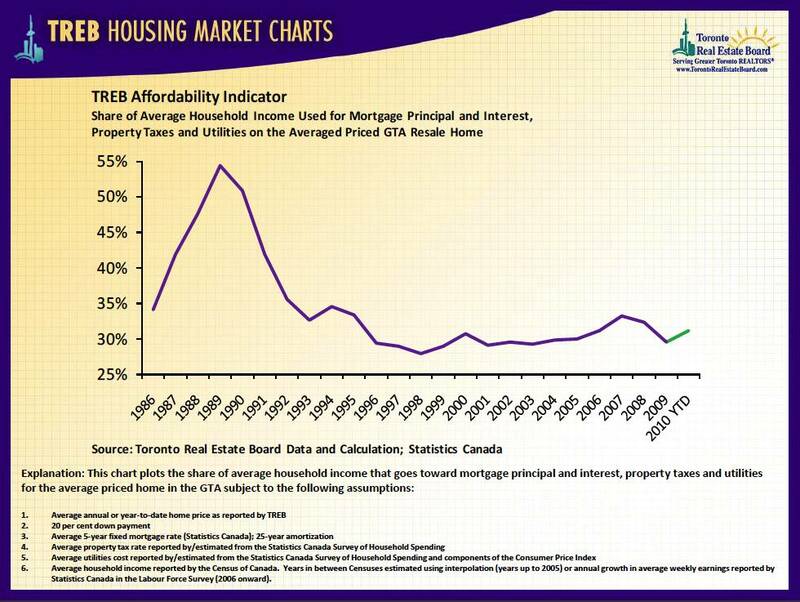 This is the latest report from TREB for last month. It shows that the current GTA Real Estate Market is healthy. 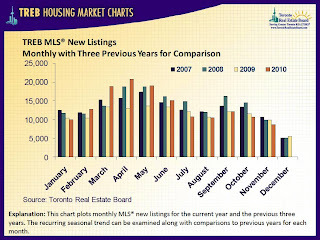 November 3, 2010 -- Greater Toronto REALTORS(r) reported 6,681 sales through the Multiple Listing Service(r) (MLS(r)) in October 2010. This represented a 21 per cent decrease compared to the 8,476 sales recorded in October 2009. Through the first ten months of the year, sales amounted to 75,582 - up one per cent compared to the January through October period in 2009. 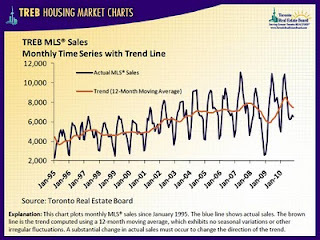 "The annual change in sales and average selling prices has been quite uniform across the GTA and by property type as the market has balanced out from record levels of sales in the second half of 2009 and first few months of 2010," said Toronto Real Estate Board (TREB) President Bill Johnston. 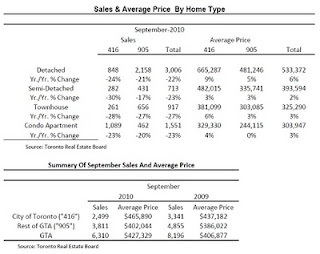 "The composition of GTA home sales does differ depending on location. Condominium apartments accounted for 42 per cent of total sales in the City of Toronto and almost 60 per cent of sales in TREB's central districts," Johnston continued. "In regions surrounding the City of Toronto, in contrast, low rise home types accounted for almost 90 per cent of transactions." The average price for October transactions was $443,729 - up five per cent compared to the average of $423,559 reported in October 2009. The average selling price through the first nine months of the year was $430,802. 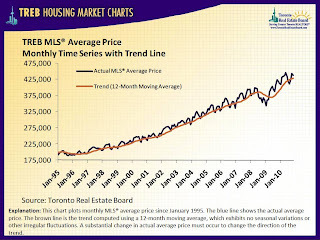 "The average selling price in the GTA has continued to grow relative to 2009 because home ownership has remained affordable," said Jason Mercer, the Toronto Real Estate Board's Senior Manager of Market Analysis. "A household earning the average income in the GTA can comfortably afford the mortgage payments associated with the purchase of an average priced home." "The outlook for mortgage rates and income growth over the next year is favorable. The average home selling price could increase moderately next year and remain affordable for the average GTA household," continued Mercer. In October, the median price was $366,000, from the $357,000 recorded during October of 2009. This article below is an excellent summary of the results of the vote and the potential implications that opening up the MLS system to the public may have. A more open system will encourage private sellers to list their homes on the MLS for a small fee yet allow for the current system to continue as it is. One more choice for the consumer! The winds of change were blowing outside a St. John's hotel Sunday afternoon, as representatives of the country's 101 real estate boards voted 97 per cent in favour of a deal that some warned could mean the end of the Canadian Real Estate Association. At the very least, it will change the current face of the Multiple Listing Service (MLS). The controversy began earlier this year when Competition Bureau Commissioner Melanie Aitkin announced she was investigating complaints of anticompetitive behaviour, including concerns CREA kept its members from offering services that would lower costs for consumers. Some of the biggest complaints involved the popular MLS system, with complaints agents were charging full commission just to post a listing. If clients didn't use an agent, they couldn't list their property on MLS. That sparked intense negotiations between CREA and the Competition Bureau in the months leading up to Sunday's vote. And if CREA members didn't vote in favour of the deal, there were looming threats of a court battle next spring with the federal government. CREA president Georges Pahud said he welcomed the decision to ratify the agreement and end the Competition Bureau battle. "We are pleased that after careful consideration and reflection, real estate boards and (local real estate) associations from across Canada have endorsed the agreement." "The commissioner and CREA have agreed that its rules as well as those of members should not deny or discriminate against realtors wishing to offer mere posting services. CREA does not believe that such rules exist today, but if they do, they must be repealed or boards will lose their license to operate under the MLS trademarks" Pahud said in a statement. Reaction from Canada's estimated 100,000 agents was swift. "If this vote goes through, it's time for the full time real estate sales people to leave the CREA," Greg Chiang, of ReMax Omega in Newmarket, Ontario, wrote in an email prior to the vote. "We will pull all our listing(s) from the MLS system. Let all the FSBOs start their own MLS system ...It takes money to build up a great real estate system, (and) that is why most discount systems fail. The FSBOs want to take a free ride on our backs ...use the system that we as full time realtors have paid for many years to develop and make what it is today." Others questioned why the Competition Bureau was even getting involved. "I don't understand why the brokerage community has been targeted, and why the system we have built up with our fees over the years should be treated like public property," Steve Glogowski, an associate vice-president of Royal LePage Signature Realty in Toronto, said in another email. "Brokers do not have a monopoly on selling property. Everyone is free to advertise and negotiate their sale in the newspapers or on the web and not use the MLS," he added. Glogowski suggested instead of "caving in", CREA should disband and hand over the MLS system to its members. "How can a system with dozens of owners be considered a monopoly?" he asked. "If people think they will save a few bucks by selling on their own, they are sadly mistaken." The deal with the Competition Bureau could result in buyers listing at an unrealistic price and not getting serious offers, not negotiating effectively based on experience and having a have increased chance of fraud, he said. As rumours of the deal filtered out in advance of the vote, some entrepreneurial realtors saw opportunity. Details emerged late last week that the largest of those private sale companies, Moncton, N.B.-based PropertyGuys.com, had signed a deal with Harvey Real Estate Co. Ltd, a tiny brokerage in Hamilton, Ont. The arrangement would see Harvey listing PropertyGuys.com client's properties in Ontario on the MLS site for a fee, if the client wishes. The MLS profile would then link to a client's customized PropertyGuys.com profile. The broker has been posting PropertyGuys.com listings for a week now and there is still a backlog, according to a report in the local New Brunswick Business Journal. It added PropertyGuys.com expects the overall opening of the marketplace to boost their listings by 30 to 40 per cent in the next year alone. How will this vote affect you? We want to hear from you, tell us how you feel using our comments feature, below. 2010, 2.3% in 2011, and 2.6% in 2012.
to global imbalances as a downside risk to the global recovery. at the end of 2012 - a year later than estimated in July's MPR. and then gradually rise to 2.0% by 2012.
of a synchronized financial crisis, than July's more optimistic forecast. near-term, with a bottom at 1.3% in the Q1/2011. * The BoC has raised the issue of household debt as a risk to the outlook. changes may be a more appropriate channel for prudential action. overnight rate to 2.00% and 3.00% at the end of each respective year. would post them on my blog, great read, Enjoy! CDN $ @ 1.0009 I guess that is par. This Chart shows the Average Home Prices January 1995 to Current Month. decrease again over the winter months. since 1995 up until 2008 when the market began to soften overall. interest rates for about the past 6 or 7 years or so. 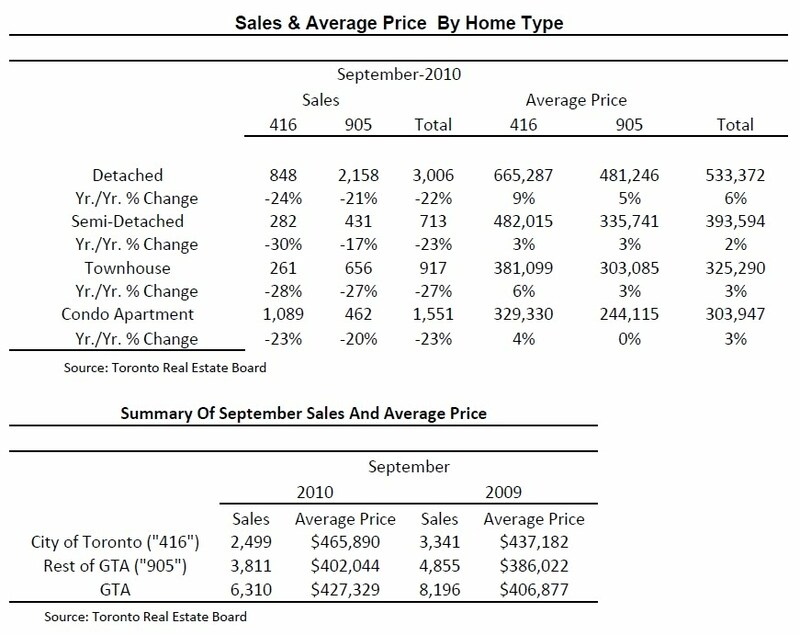 TORONTO, October 5, 2010 -- Greater Toronto REALTORS(r) reported 6,310 sales through the Multiple Listing Service(r) (MLS(r)) in September 2010. This represented a 23 per cent decrease compared to the 8,196 sales recorded during the same period in 2009. Through the first nine months of the year, sales amounted to 69,069 - up four per cent compared to the first three quarters of 2009. "The level of sales in the second half of 2010 has been lower, representing a balancing out period following record levels of sales in the latter half of 2009 and first few months of 2010. We remain on track for one of the best years in history for existing home transactions in the GTA," said Toronto Real Estate Board President Bill Johnston. The average price for September transactions was $427,329- up five per cent compared to the average of $406,877 reported in September 2009. The average selling price through the first nine months of the year was $429,657. 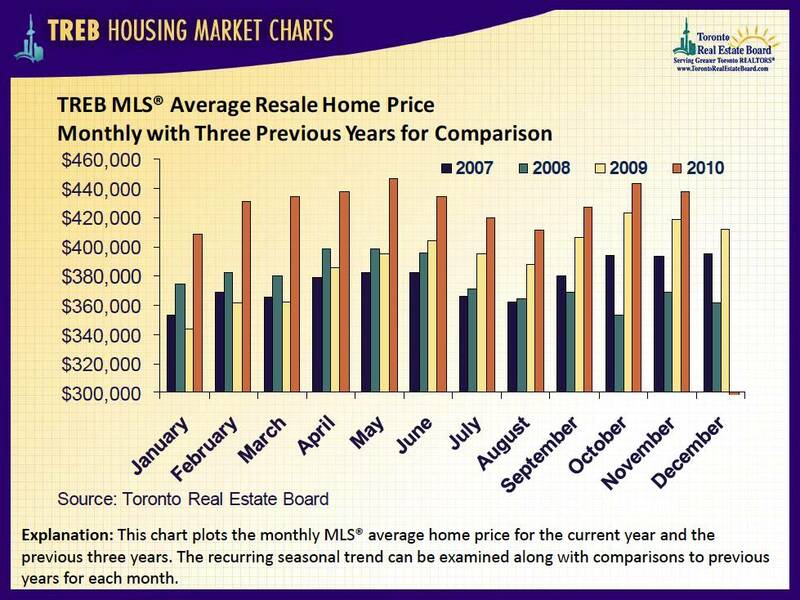 "Resale homes in the GTA remain affordable," said Jason Mercer, TREB's Senior Manager of Market Analysis. "It is important to consider the positive impact of declining mortgage rates over the past two decades. Simply considering home prices relative to incomes does not allow for an accurate analysis of affordability," continued Mercer. "The share of average household income going toward a mortgage payment on the average priced home in the GTA remains within accepted lending guidelines. This is why the average home selling price has continued to grow." the company you should choose! I received an email with good questions about the average price graphs and will post the question and my answer below. The information preceding the graph indicates that it relates to single family homes. Does that include condominiums? If so, is there a graph that excludes them? I understand that condominiums dropped more sharply than detached homes in the early 1990s, and it would be interesting to see that separately. Yes, single family includes condominiums, all housing types that are single family. See the housing types and breakdown for last month in the table below, as an example. Let me see if I can find the data for the same period for only condominiums. From what I have seen in the past, there will be no breakdown for only condos. Each area and district is broken down for each housing type, but it would be a monstrous task to go through each monthly issue for each year to gather the data for each area and then put them all together. I'll see what I can find out and get back to you if I find something. Whether this trend continues or not is yet to be seen! a M/M gain of 0.6 per cent. growth of 0.0 per cent in June (from an initial estimate of 0.1 per cent). namely British Columbia, Ontario and Nova Scotia, reporting declining sales. July served as major impediments to growth in retail sales. peaked at the national level). better picture for retail sales at the onset of Q3.